An arboretum walk, a mature tree flowering and leafing out, a lovely spring day, a – gall. A bunch of galls, in fact, on this one tree. At first glance, the galls looked like horned-oak or gouty oak galls, round to oblong stem galls that occur on oak. The areas on the stems even looked sort of oak-ish at first, with masses of pollen-bearing male catkins evident. Not an oak, though, as the compound leaves attested. It was a hickory, and the galls, unlike the insect-induced horned oak and gouty oak galls, were caused by a fungus, the Phomopsis fungus to be exact. This fungal gall is not all that common and in fact, though it looked sort of ominous on this tree, with dozens of rounded, craggy galls, it does not seem to be harmful to overall plant health. The Phomopsis fungus enters through wounds and unlike the sunken stem galls that species of this fungus cause on other trees, such as Russian olive, the tree reacts with the development of this abnormal growth. 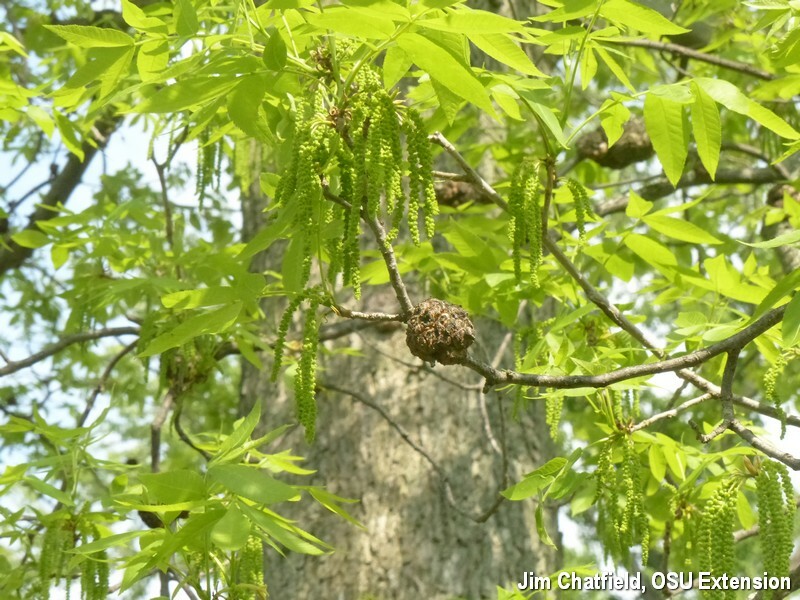 If it develops on young hickory trees, galls can be pruned out.